Album artwork has been going the way of the dodo bird for some time now. But that doesn't mean some people don't enjoy whipping out their creativity and putting some fresh paint on the classics. The British humor website b3ta recently offered visitors the chance to "extend album art" - which meant that if you had a computer and a new of looking at the world, you could literally stretch the boundaries of famous album covers. 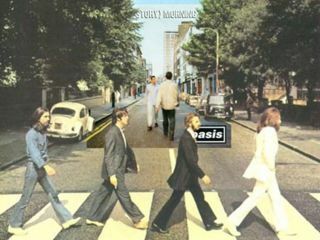 No doubt Noel Gallagher had no problem joining The Fab Four on Abbey Road - heck, he probably did this one himself. Take a look at the new versions right here. And hey, if you have your own version of The Wall or Nirvana's Nevermind or anything else for that matter, feel free to send us the results. We love stuff like this.